_ Hello and Welcome to Annabelle's Cookies and More! Ever since I was a little girl, I loved to cook and create delicious treats for others to enjoy, especially Italian Cookies and Italian Cakes! I would sit and watch my mother and grandmother whenever they would cook and bake. I then would try to make delicious creations of my own. Well, after a few mishaps and years of perfecting one recipe after another, I believe that I have finally mastered the art of baking (or so I am told that I have). Fortunately, I inherited my grandmother's Italian cookie recipes and am able to bake up a number of these delectable "Italian biscotti." When it comes to my wedding and specialty cakes, I am a self-taught decorator and do all of my artwork freehand. Thus, I am not always able to duplicate things exactly when it comes to the finer points of my designs. 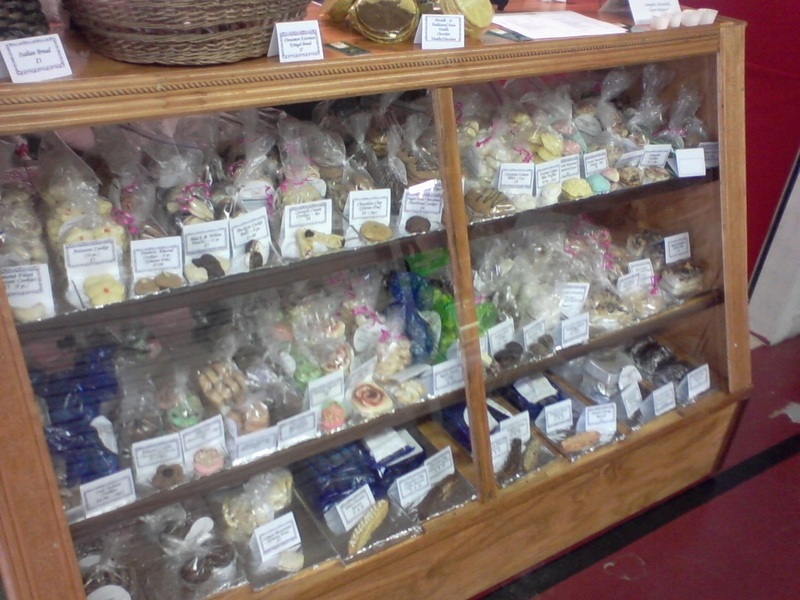 At Annabelle's Cookies and More, I personally hand mix, roll, dip, bake, and decorate every delectable treat. Most of my Italian Cookies, Biscotti, Truffles, and Cakes are created from Italian recipes that have been handed down through the years from one Italian generation to another, with the exception of a few of my own Italian cookie creations! All of my Italian Cookies, Truffles, Wedding Cakes, Birthday Cakes, Anniversary Cakes, and other specialty treats are 100% homemade. I use only the freshest ingredients possible (no preservatives). It is important to note for those who may have food allergies that I bake in a facility where there are wheat products and nuts used and many of my Italian Cookies actually contain nuts in some form or another. While I can NOT "guarantee" that cross-contamination may occur, I do have dedicated baking days where I utilize only equipment used to make gluten-free cookies and cakes and for those who are wheat sensitive and for those who have nut allergies. Please feel free to inquire about pricing for gluten-free, sugar-free, and even vegan treats! I create everything to order and do require a 72-hour (minimal) advance notice to have your bakery treat ready. Time is needed to bake and decorate your treats. Please also note that I ship on Mondays and Tuesdays only. This is to ensure that your bakery treats will arrive during the week. Please keep this in mind when ordering. Also, please note that at this time I am unable to ship cakes except for Fruit Cakes and Rum Cakes. Additionally, note that the holidays are an extremely busy time for me and I do often get booked up early. Thus, I do recommend that you place your holiday orders at least two weeks in advance to be assured that I will be able to accommodate you. Also, please keep in mind when ordering for a wedding, special event or placing specialty cake or large orders, additional preparation time is required (in most cases -- 1 week at minimum). Note that (area) Daytona Beach Wedding Cake orders should be placed at least three months in advance. (Although, in some instances, I have been booked a year in advance for particular wedding cakes.) Please email me at annabellescookiesandmore@gmail.com to discuss such cake and/or cookie orders. I welcome custom orders, so if you do not see a particular treat that you would like to order, please do not hesitate to contact me to discuss if it is something that I can create for you and for pricing. I do cater Weddings, Anniversaries, Birthday Parties, Corporate Events, and other specialty events and would be happy to share with you information regarding wedding planning, limousines, ﻿party buses﻿, photography and wedding venues. Italian cookies not only are for weddings and other special events, but also are sweet little treats that can brighten your day. Whether you enjoy a good Italian cookie to compliment your meal or are looking for something sweet to go with your espresso or coffee, we have the Italian cookie to meet your needs! If you have any questions regarding my little Italian Bakery or would like to arrange for delivery of your Italian Cookies, Biscotti, breads, and/or pastries, please feel free to contact me at 386-453-5872 or use my Contact Form to do so. You can also arrange to have your Italian cookies and biscotti delivered to you locally or you can come visit me at my store located on Seabird Island inside A&A Eats & More, 94 Dunlawton Ave, Port Orange, FL 32127.